which is a linear mixed model with pseudo-response , fixed effects , random effects , and . With these statistics, the pseudo-response and error weights of the linearized model are recomputed and the objective function is minimized again. The predictors are the estimated BLUPs in the approximated linear model. This process continues until the relative change between parameter estimates at two successive (outer) iterations is sufficiently small. See the PCONV= option in the PROC GLIMMIX statement for the computational details about how the GLIMMIX procedure compares parameter estimates across optimizations. Profiling of can be suppressed with the NOPROFILE option in the PROC GLIMMIX statement. Where possible, the objective function, its gradient, and its Hessian employ the sweep-based W-transformation ( Hemmerle and Hartley 1973; Goodnight 1979; Goodnight and Hemmerle 1979). Further details about the minimization process in the general linear mixed model can be found in Wolfinger, Tobias, and Sall (1994). is the approximate estimated variance-covariance matrix of . Here, and . The square roots of the diagonal elements of are reported in the Standard Error column of the “Parameter Estimates” table. This table is produced with the SOLUTION option in the MODEL statement. The prediction standard errors of the random-effects solutions are reported in the Std Err Pred column of the “Solution for Random Effects” table. This table is produced with the SOLUTION option in the RANDOM statement. As a cautionary note, tends to underestimate the true sampling variability of [ , because no account is made for the uncertainty in estimating and . Although inflation factors have been proposed (Kackar and Harville, 1984; Kass and Steffey, 1989; Prasad and Rao, 1990), they tend to be small for data sets that are fairly well balanced. PROC GLIMMIX does not compute any inflation factors by default. The DDFM=KENWARDROGER option in the MODEL statement prompts PROC GLIMMIX to compute a specific inflation factor (Kenward and Roger, 1997), along with Satterthwaite-based degrees of freedom. and transforms and a generalized inverse of the left-side coefficient matrix by using . The GLIMMIX procedure computes the variance of by default as . If the Hessian is not positive definite, a sweep-based generalized inverse is used instead. When the EXPHESSIAN option of the PROC GLIMMIX statement is used, or when the procedure is in scoring mode at convergence (see the SCORING option in the PROC GLIMMIX statement), the observed Hessian is replaced with an approximated expected Hessian matrix in these calculations. Table 43.23 gives expressions for the Hessian matrix depending on estimation method, profiling, and scoring. 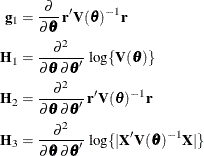 The “Modified” expressions for the Hessian under scoring in RxPL estimation refer to a modified scoring method. In some cases, the modification leads to faster convergence than the standard scoring algorithm. The modification is requested with the SCOREMOD option in the PROC GLIMMIX statement. To recompute the pseudo-response and weights in the SS expansion, the BLUPs must be computed every time the objective function in the linear mixed model is maximized. The PA expansion does not require any BLUPs. The four pseudo-likelihood methods implemented in the GLIMMIX procedure are the factorial combination between two expansion loci and residual versus maximum pseudo-likelihood estimation. The following table shows the combination and the corresponding values of the METHOD= option (PROC GLIMMIX statement); METHOD=RSPL is the default.